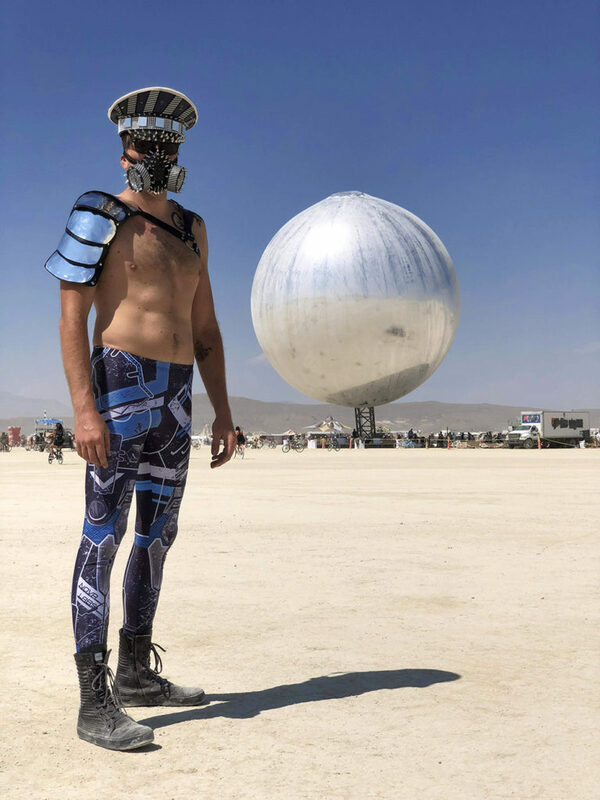 I was commissioned to create burning man fashion pieces for the Robot themed event at Black Rock City, Nevada. These wearable art pieces were playa ready and held up well despite the harsh conditions. The San Francisco clients were able to do local fittings and pickup which made the process easy. The concept was taken straight from the theme — they wanted something metallic, reminiscent of a robot, functional on the playa, and one of a kind. We created a series of mix and match pieces that can be added and layered depending on the weather conditions and temperature. 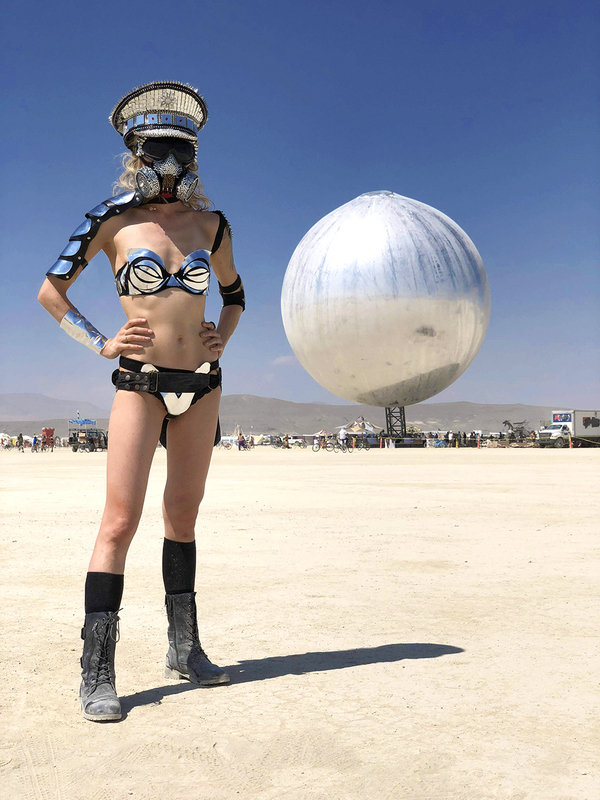 For the women we made metal arm guards, metal shoulder guard, a two piece metal bikini set, goggles, matching festival mirrored hat and a blinged out burning man gas mask to help brave the dusk (fully functional). The goggles had some bling on them but were picked to work well with the hat and gas mask when worn together. 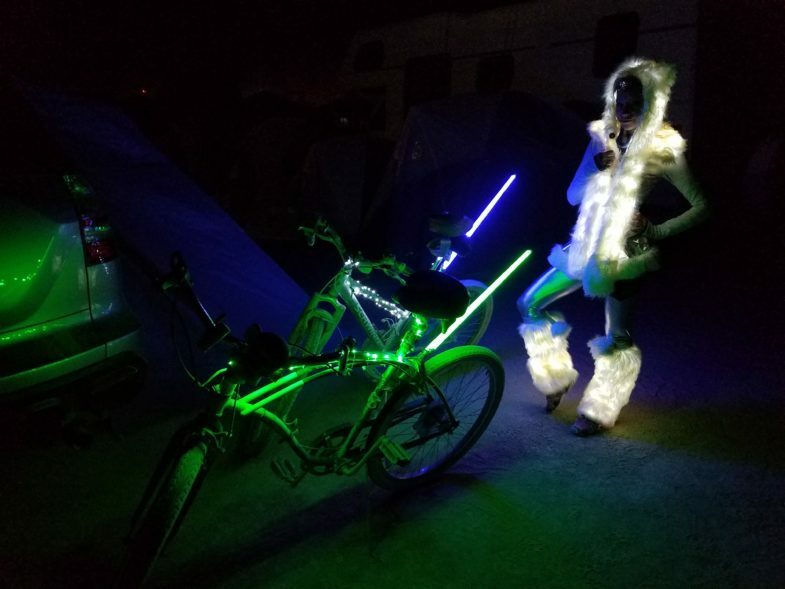 The pieces were functional for playa and Burning Man — they were easy to bike in, light weight, easy to dance in, and didn’t add to the heat. For the man we paired him with a matching asymmetrical metal shoulder guard, mirror and reflective festival hat, and matching festival gas mask. He did not like feeling constricted so he was pleased with the ease of wear. 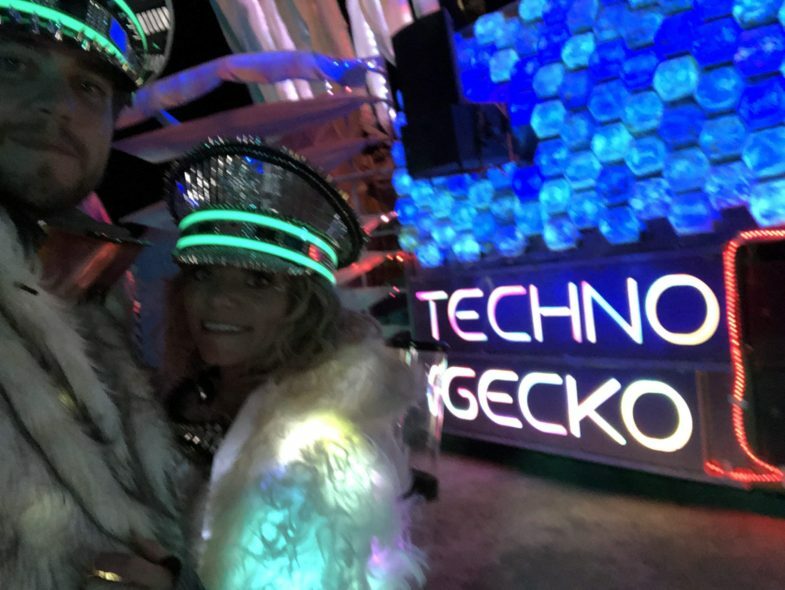 The burning man fashion night pieces were light up jackets that were easy to operate yet would keep them warm — they had multiple on/off switches and the batteries were easily access to replace when necessary. The furry hat had a compartment to hide the light controllers in as did the full length furry coats. The burning man festival hat converted from day to night with EL tape that was easily secured to the hat when desired / dark out. I am a San Francisco based wearable art and fashion designer. I love doing commissioned burning man fashion pieces like this, especially for clients local to the Bay area. If you are interested in having a piece made for you for an upcoming event, send along your parameters, date it is needed by, and what exactly you are looking for. We ask for at least 3 weeks notice to ensure we can source the material, create the piece, and hold a fitting.